﻿Post Script: To see more about the flowers in the vase. Please press the My Garden Tab at the top of this page. oh my, this colorful tea set is really outstanding. Like a sunny day in bright yellow and dark blue. And the blueberry tartletts are perfect with it. The other two cups are so charming. I love the pearly inside also as I am a great fan of MOP-things. Thank you for sharing those beauties. 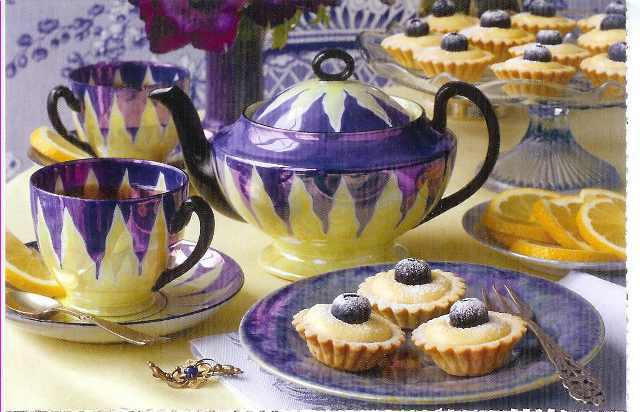 Love your blue and yellow teapot and cups - that first photo is absolutely stunning! Love your header too. So glad I could join you for tea today. Oh, Betty, I do love lusterware myself! 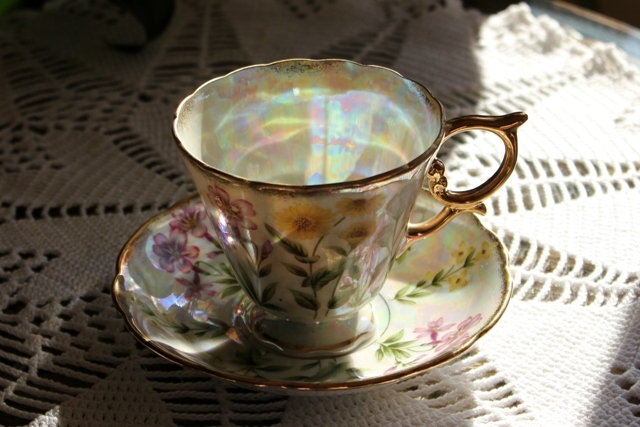 Your floral teacups are truly gorgeous and your camera did such a fantastic job picking up on the iridescence of each one too! The blue and yellow set is gorgeous as well but the little teacups have stolen my heart. Those little tartlettes look yummy! Thanks for sharing your beauties and thanks for joining me for tea. This is lovely. I am hosting a Giveaway on my blog and would love for you to stop by. 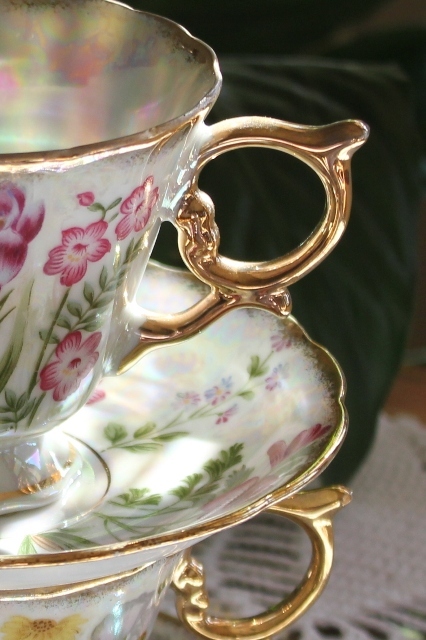 Those teacups are just too pretty. You are lucky to have so many beautiful items. Thanks for sharing. 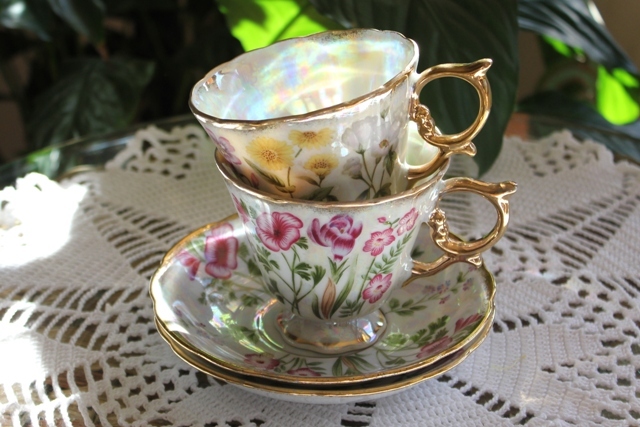 Your teacups are pretty, I can see why you love lusterware. Oh how pretty! The blue is just stunning! 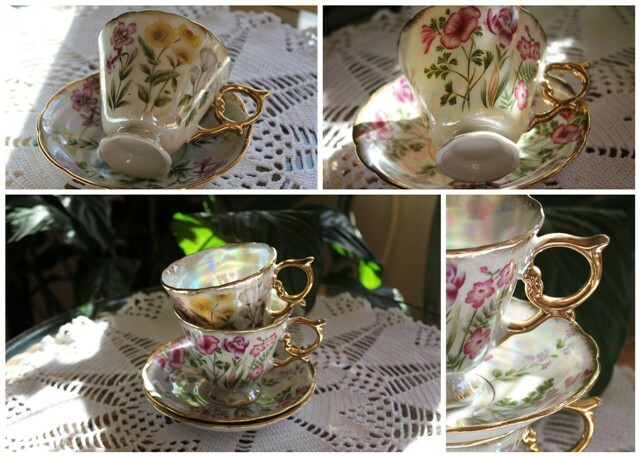 Your Lusterware teacups are beautiful! I have just a few pieces of Lusterware, but mine are not as colorful as yours. 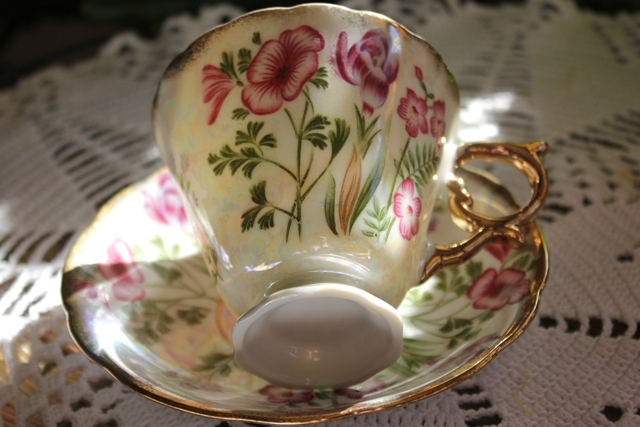 you lusterware teacups are just lovely! 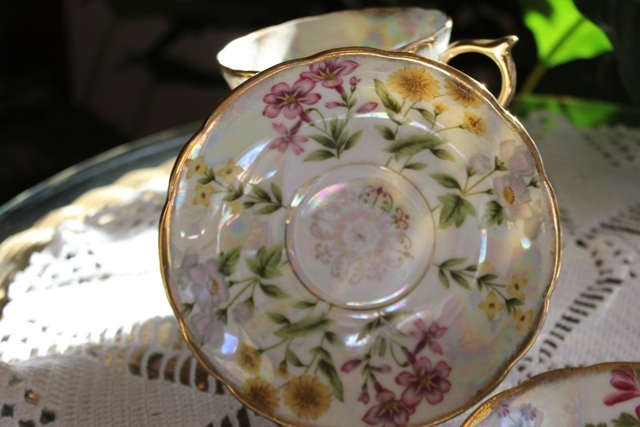 love the floral pattern on them with gold handle.. perfect! happy TT and have a great day! Your lusterware is stunning! Thanks for sharing it with us. I agree wholeheartedly with you, I love lusterwear too! 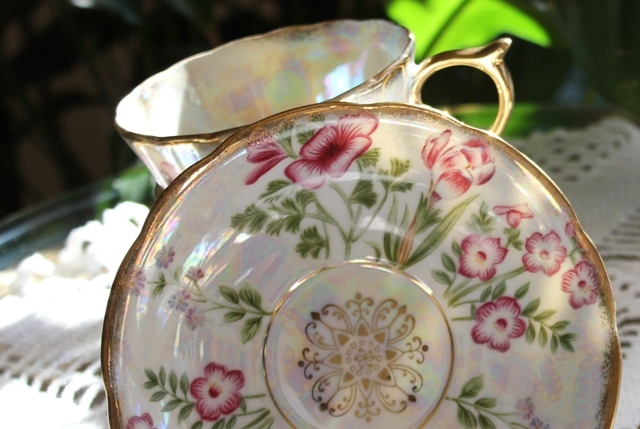 I have a platter that I swoon over and a few Tea cups too. Your tea set is totally amazing. What brilliant colors. 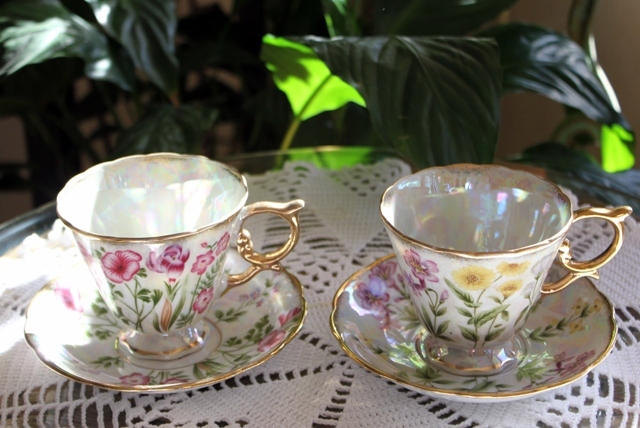 And your two floral tea cups are gorgeous. They look so dainty and lovely. Thank you so much for sharing these with us today. Hello,Wow! I must agree with you they're fantastic.You took such gorgeous photos of them.I have to now play around with my lusterware and see how the photos come out. Never knew lusterware photoed so amazingly. I just adore luster ware and your pieces are stunning! I collect the "made in Japan" kind that is in shades of peachy orange and somewhat oriental looking. Very pretty. I think I have one cup in lusterware..now I will have to check!! I love the teacups! Congratulations on celebrating your 50th wedding anniversary! Your blue and yellow lustre wear set is so charming and cheerful! Just what is needed to combat this chilly weather! Do drop by my blog sometime soon for a spot of virtual splosh! 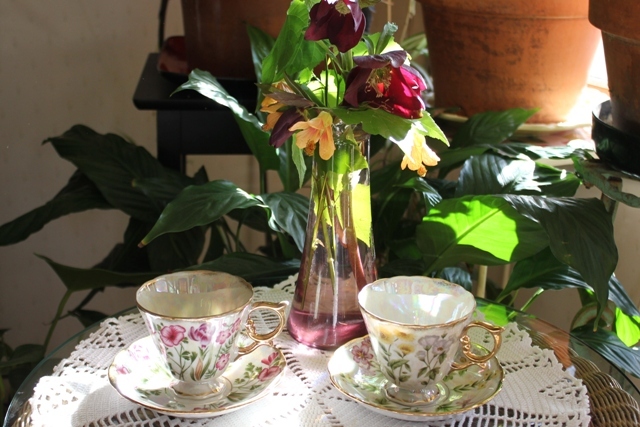 You are most welcomed anytime, as the teapot in blogland is always on. What lovely lustreware teacups and teapots..,Congratulations of your 50th wedding anniversary! Thanks for joiningus for TTTT and also our 69th,'Tuesday For Two'. Please pop by 'for tea' anytime! Stunning! I can see why you love lusterware. Its not often found. These are the prettiest I have seen. Thank you for sharing your post with us. Looking forward to sharing a cup of tea again, soon. 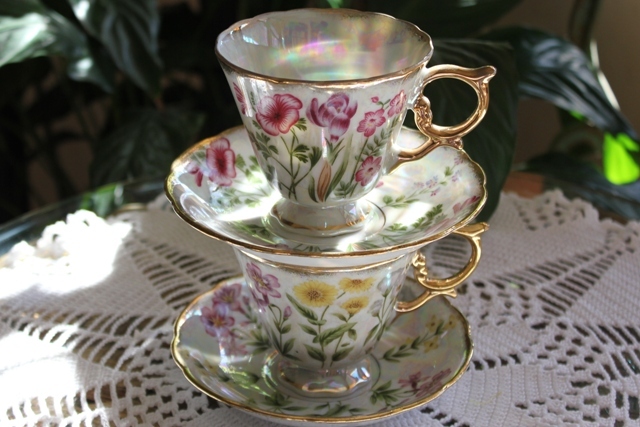 What a beautiful trio of lustreware!I have never seen it in that color combination.